Bona has long been considered one of the best specialty floor cleaners on the market, and it’s not hard to see why. The Bone Stone, Tile and Laminate Floor Cleaner is a versatile product, formulated for non-wax sealed flooring systems like ceramic, natural stone, terrazzo ​and marble. It’s made from a water-based solution, so you don’t have to rinse it after you’ve sprayed and mopped up. It leaves behind a subtle sheen but doesn’t make floors slippery. After you’ve sprayed, simply use a soft rag or fiber cloth mop to wipe up (just make sure it’s clean first). 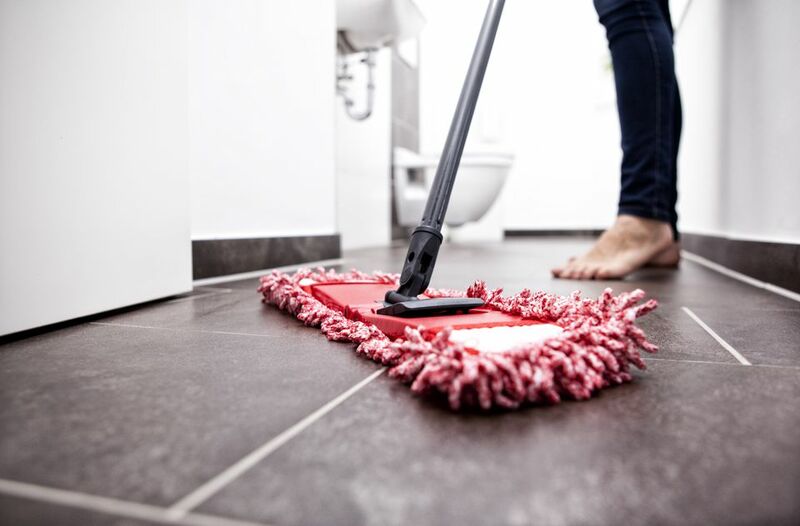 Reviewers say Bona cleans efficiently, and without streaks (a common concern among competing products). Plus, at such a low price point, it’s affordable enough that you can stay fully stocked at all times. If the shade of your grout has noticeably changed since you installed it, it’s time to focus on bringing it back to life. The Black Diamond Stoneworks Ultimate Grout Cleaner is made with dirt in mind, working to eliminate grime from any color of grout without bleaching it. It’s safe for natural tiles like marble and is acid-free, so it won’t damage delicate flooring. To use, simply spray and leave for up to three minutes, then use a brush to scrub the grout lines. It works well on tiles in any room — especially kitchens, as it cuts through grease and oil. If you’ve neglected your tiles and they’re looking a little worse for wear, Black Diamond can help bring them back to life. If you’re looking for a floor cleaner for a large space or one you can use every day, the Aqua Mix Concentrated Stone is a solid choice. This routine cleaner is great for any water-safe surface and is phosphate-free, so it’s safe for everyday use. It removes dirt and buildup and prevents future soap scum or hard water staining. Simply add a cap filled with the solution and mix with a bucket of water to clean away grime (no rinsing needed). It leaves behind a subtle spearmint scent, so it’s great for houses with pets. Because it’s concentrated, reviewers say one bottle will last a lifetime. While Aqua Mix isn’t the best spot treatment on our list, it’s the best choice for routine everyday cleaning. Natural stone tiles like granite, marble and limestone are more delicate than other materials and are often used in flooring around pools, in bathrooms and other moist areas. If you’re struggling with mold and mildew buildup on your floors, StoneTech Mold & Mildew Stain Remover works to fight it without damaging delicate tiles like marble. This specialty cleaner removes stains by using some powerful chemicals (be careful if you have asthma), so the manufacturer recommends using gloves and a mask when applying the product. Simply spray and scrub, and stubborn mildew and mold stains will disappear. Many reviewers recommend this cleaner for bathrooms or natural stone pathways, but it works well anywhere you have mold to battle. If you’re working indoors, just be sure to keep the room well ventilated. If you want a cleaner made specifically for porcelain and ceramic tiles, Miracle Sealants Porcelain and Ceramic Tile Cleaner is a great choice. Each bottle comes with 32-ounces of product and can be used as-is. It utilizes a delicate scouring compound to gently remove grease and grime without scratching tiles. It also works well on colored grout, as it doesn’t use bleach and won’t stain or discolor. Reviewers say it takes up even the most stubborn stains, remarking that it’s the only product that restored their ceramic tile to its original glory. Method Squirt & Mop Hard Floor Cleaner is great for those with allergies or asthma, because it provides a gentle, chemical-free clean without the harsh scents. It also works on hardwood and laminate, so it’s a great all-around cleaner to keep stocked. This biodegradable formula can simply be squirted onto a surface (no mixing with water), requires no rinsing and is safe around crawling babies or pets. It’s lightly scented with a fresh lemon ginger smell, but reviewers say it’s subtle enough that most don’t notice it. Reviewers add that it doesn’t leave behind streaks, and love its effective stain-fighting power. It does give surfaces a slight sheen but doesn’t add a waxy or slippery feel to your floors. If shine is what you’re after, Bone High-Gloss Stone, Tile and Laminate Floor Polish is the stuff for you. Meant to be used after you’ve cleaned your floors with another product, the Bona Polish covers up to 500 square feet and works to fill in micro-scratches, leaving behind a layer of protection on your floors. Made from a urethane-acrylic formula, this polish can be used once every two to five months to maintain shiny floors. The manufacturer does recommend you purchase their Bona Applicator Pad to ensure even distribution, but a fiber cloth mop would work as well. Bona offers wonderful customer service and will walk customers through the cleaning process if they’re struggling to achieve the results they want—always a great perk. Finish your tiles off with this polish, and they’ll look like they’ve just been installed.